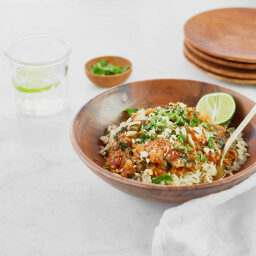 HEALTHY COMFORT FOOD FOR THE WIN! Whohoo. No matter who you’re cheering for, if you’re looking for a tasty game day appetizer, this is the recipe for you. It could even double as a cozy Valentine’s Day meal in or I’m-so-sick-of-winter family pick-me-up. Not that you really need a reason anyway because, seriously, look at these plant-powered beauties! I posted this recipe to the app over the weekend and was thrilled to see so many of you run right to your kitchens to make them! I have to say, I’ve had a pretty bad case of the winter blahs this month. I kicked off the new year feeling uninspired and was soon run down by a cold, random injury, rough parenting phase, and string of bad sleeps. Anyone else have a tough start to the new year? I’ll be welcoming February with WIDE OPEN ARMS and all the heart-eyed emojis this Thursday, I tell ya! 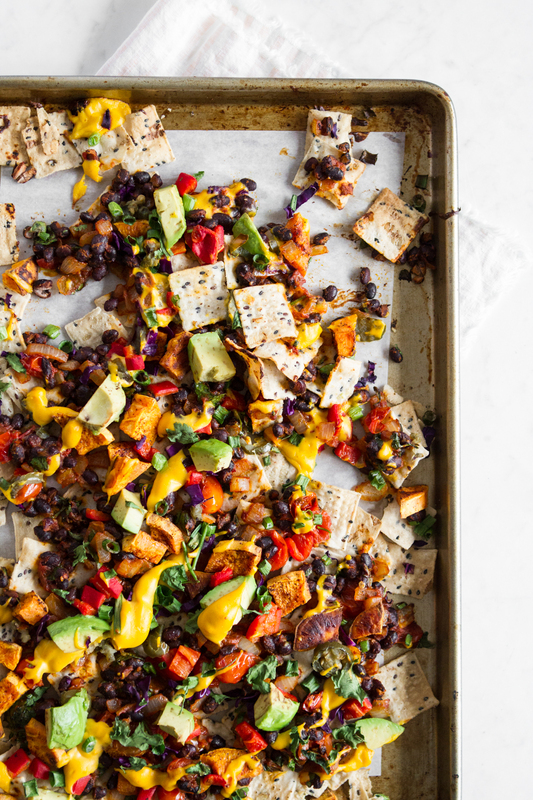 Not surprisingly, that low energy and lack of inspiration crossed over into dinnertime menu planning, so in a bid not to serve the same meal for the 15th time I came up with these nachos to change up our regular rotation. And I’m so glad I did—they were a huge hit! I also love that the All-Purpose Vegan Cheese Sauce and Spicy Black Beans can be made in advance so the meal comes together fast. Here’s a fun GIF showing how I built the nachos! Full disclosure: I went light on the cheese sauce for these photos, but just know that in real life I’m dumping that stuff on!! 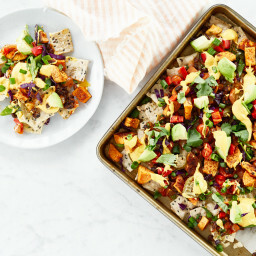 My family and I were getting a bit tired of our regular weeknight dinners so I came up with this crowd-pleasing nacho plate to freshen things up. It can also make for a cozy date-night-in meal alongside a good movie or game! The beauty of this recipe is that you can make a couple components in advance, and pick and choose which store-bought foods you’d like to include to save time (like salsa or guacamole). I encourage you to customize this nacho plate to your heart’s content! If you’re looking to cut down on prep work, you can make the All-Purpose Vegan Cheese Sauce and Spicy Black Beans in advance (they’ll keep in the fridge for a few days) so there’s less you’ll need to do the day of. Begin preparing the All-Purpose Vegan Cheese Sauce by soaking 1/4 cup cashews in a small bowl of boiling water for at least 30 to 60 minutes. Prepare the All-Purpose Vegan Cheese Sauce. While you’re making the cheese sauce, preheat the oven to 400°F (200°C) and line a medium rimmed baking sheet with parchment paper. Set the cheese sauce aside once prepared. Spread the chopped sweet potato onto the parchment-lined roasting pan and toss with the oil. Sprinkle with a generous amount of salt and chili powder. Roast for 25 to 30 minutes, until the bottoms are lightly charred. While the potatoes are roasting, prepare the Spicy Black Beans found in my DIY Burrito Bowl recipe (linked in ingredient list). After cooking, leave the beans in the skillet so you can reheat them just before layering onto the nachos. Gather and prep any fresh toppings you’d like to use so they’re ready to go. Please note my measurements are simply a guide. Feel free to add as much or as little of each as you wish! 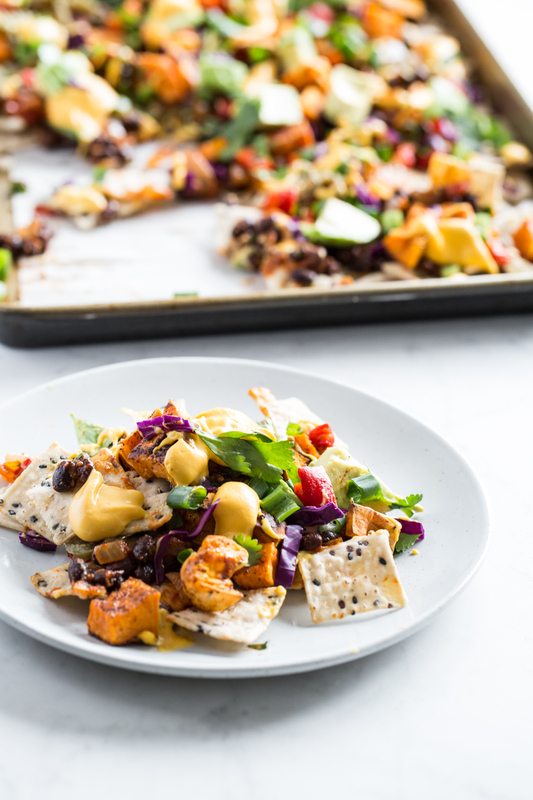 On a medium rimmed baking sheet or platter (if your sweet potatoes are finished roasting, feel free to set them aside and re-use the same sheet here), spread a layer of chips to cover the base entirely. 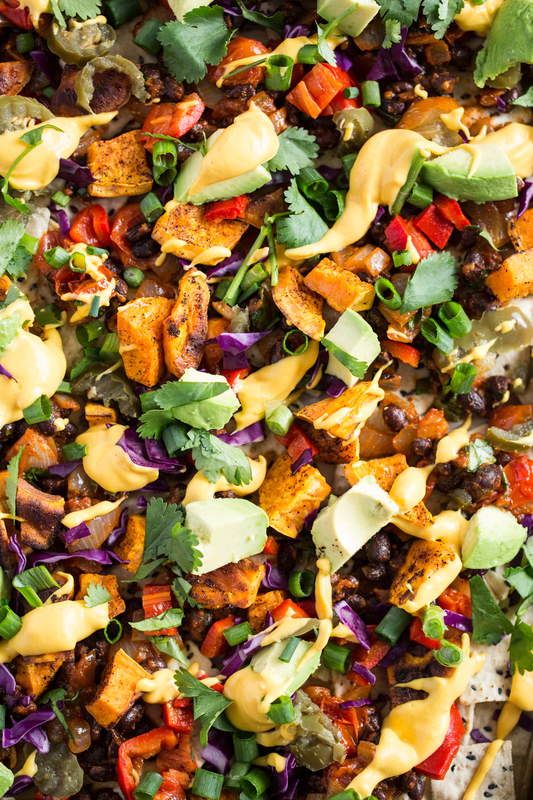 For warm nachos, reheat the Spicy Black Beans in the skillet and the All-Purpose Vegan Cheese Sauce in your microwave or a small pot on the stovetop. 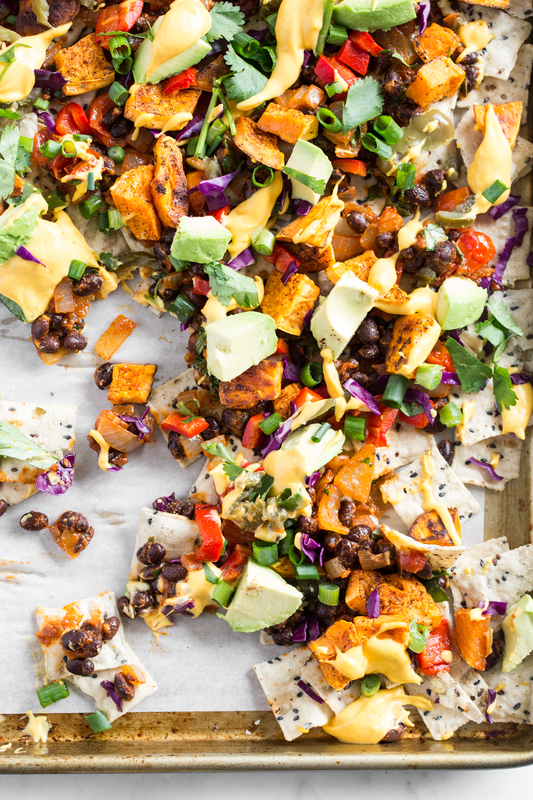 Now it’s time to dress up those nacho chips! Layer the beans first before adding cheese sauce, roasted sweet potatoes, avocado (or guacamole, if using), green onion, pickled jalapeños, roasted red pepper, cabbage, cilantro, and salsa. Season with salt and serve immediately. Nutritional info includes one (200 gram) bag organic corn chips, 1 batch of Spicy Black Beans, 1/2 cup salsa, 1/4 teaspoon salt, and 1 batch of All-Purpose Vegan Cheese Sauce. * You may have leftover cheese sauce, but because blending a half-batch can be difficult, I suggest preparing the whole recipe as directed. I love having leftovers on-hand to mix into pasta, top off a bowl of chili, layer on a wrap, etc. ** You could also switch things up by using my Lentil-Walnut Taco Meat in place of the Spicy Black Beans! I’d recommend preparing the taco meat with canned lentils so it comes together quickly. *** Looking for a guacamole recipe? Try The Freshest Guacamole in Oh She Glows Every Day, p. 65. **** My go-to brand of pickled jalapeños is Sunrise Farms Organic Pickled Jalapeños. If you don’t have any on hand, feel free to drizzle Sriracha or hot sauce for a little extra heat. ***** For a delicious homemade salsa, try my Fresh Cherry Tomato Salsa in Oh She Glows Every Day, p. 63. Store-bought works too, though! 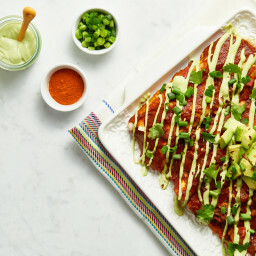 If you prefer a more classic take on cheesy nachos, you can also add a layer of shredded vegan cheese before the avocado (or guacamole), salsa, and cilantro. 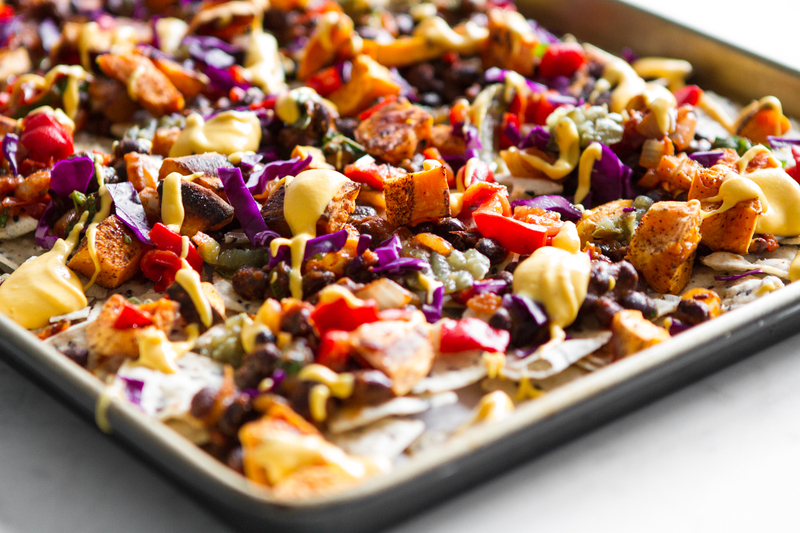 Pop the nachos in the oven for a few minutes, top with remaining fresh ingredients, and serve. If you’re looking for more Valentine’s Day recipe inspiration, here is a round-up of some faves! Psst…the first 6 recipes are also found in The Oh She Glows Recipe App (iOS/Android)! Things I'm Loving Lately: 2018 Reboot! Looks amazing!! What type of torilla chips are you using here? Love the beautiful colours, perfect for beating the winter blahs. Also, is your son 15 months? It’s a tough month, but hang in there, teething/pushing boundaries make for a long days. Hey Angela, Yep Arlo just turned 16 months, and wow have the past 5-6 weeks been rough! You nailed it about pushing boundaries and long days. Thank goodness for naptime. Then there’s the sibling battles…oh man! I’ve been dreaming of a solo vacation lately. lol. Thanks for the recipe Angela! 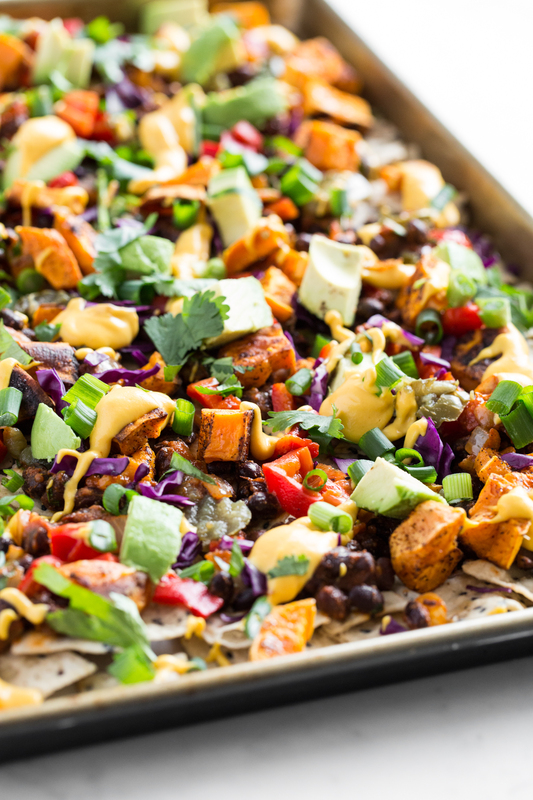 It can be difficult to come up with a way to make nachos a healthy option. Thanks for the little tidbit on saving time by pre-making the cheese sauce and the spicy black beans. A little time saving trick can make a big difference! Hey Jordan, I’d love to hear what you think if you try them out. :) And glad to hear you like the make-ahead tips. Hope you enjoy! These look beautiful! Just curious – what type of chips (crackers?) did you use here? I have SO been in a winter funk so I totally need these! Sorry to hear the funk is hitting you this month too. Spring, where are you? Aww I’m so happy to hear that, Kelly! I need to make those soon…it’s been too long. Hope you enjoy the nachos! OMG that’s the best saying ever about January!! For real. lol. Hope you enjoy the nachos if you try them out, Cayley! These look awesome! I’m going to have to try them! I just found your blog and thank god I did! Your life is truly inspiring. The way you turned your life around and came out so strong despite of your ED is commendable. Love your recipes. They are so unique and has their own value to it. I am definitely going to try these nachos. Aww Corrie, your note means so much to me. Thank you so much for all the love…I’m so honoured to be a part of your journey. 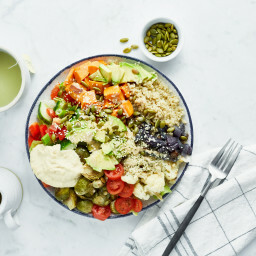 It’s so colorful and a combination of different things, plus it’s healthy and I am sure it will taste good, so there is nothing more I can ask for. This looks like it would make great taco filling too. I have an easier time controlling my portions if I have to fit everything into a corn tortilla (otherwise I may eat the entire pan!). Oh I hear you! I think it would be amazing as a taco filling..or a burrito style bowl…or on top of a salad…or or…okay I’ll stop now. lol. One of the best recipes, very easy to make , and very testy, thank you for sharing this. 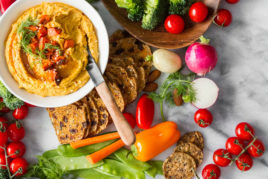 What is your favorite brand of vegan cheese? Hi Linda, Sadly I don’t have one to suggest as we don’t buy it (I haven’t loved some of the mainstream ones I’ve tried in the past). That said, there are some amazing artisanal nut cheeses out there now (from the rave reviews I’ve heard), but my local grocers don’t carry them yet. I made these last night. I loved them, and especially loved the use of things I would not have thought of – red cabbage and roasted red peppers. Satisfying, yet so good for you! Wow, thank you so much Caroline! I’m smiling from ear to ear. :) We love it too…I swear I could eat the whole pan myself. Healthy food can look so good!! Thank you for sharing with this interesting dish! Yay for vegan food! Simple enough and delicious. Thanks for the share. Previous post: Friday FAQs: Toddler-friendly snack ideas, naturally sweetened vegan chocolate, and more! Next post: Friday FAQs: Smoothie swaps, my go-to vitamins, and more!